For the other (short-lived) municipality in the Netherlands, see Naaldwijk, Sliedrecht. The village (dark green) and the statistical district (light green) of Naaldwijk in the municipality of Westland. Naaldwijk (Dutch pronunciation: [ˈnaːltʋɛi̯k] ) is a town in the Dutch province of South Holland. It is a part of the municipality of Westland, and lies about 10 km southwest of The Hague. 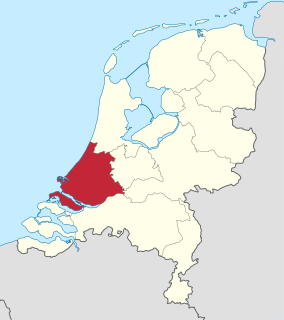 South Holland is a province of the Netherlands with a population of just over 3.6 million as of 2015 and a population density of about 1,300/km2 (3,400/sq mi), making it the country's most populous province and one of the world's most densely populated areas. Situated on the North Sea in the west of the Netherlands, South Holland covers an area of 3,403 km2 (1,314 sq mi), of which 585 km2 (226 sq mi) is water. It borders North Holland to the north, Utrecht and Gelderland to the east, and North Brabant and Zeeland to the south. The provincial capital is The Hague, while its largest city is Rotterdam. Naaldwijk lies in the heart of Westland. The largest economic sector is greenhouse horticulture. The largest flower auction site in the world, operated by FloraHolland [ nl ], can be found in the nearby village of Honselersdijk. A greenhouse is a structure with walls and roof made chiefly of transparent material, such as glass, in which plants requiring regulated climatic conditions are grown. These structures range in size from small sheds to industrial-sized buildings. A miniature greenhouse is known as a cold frame. The interior of a greenhouse exposed to sunlight becomes significantly warmer than the external ambient temperature, protecting its contents in cold weather. Horticulture has been defined as the culture of plants for food, comfort and beauty. A more precise definition can be given as "The cultivation, processing, and sale of fruits, nuts, vegetables, ornamental plants, and flowers as well as many additional services". It also includes plant conservation, landscape restoration, soil management, landscape and garden design, construction, and maintenance, and arboriculture. In contrast to agriculture, horticulture does not include large-scale crop production or animal husbandry. Honselersdijk is a town in the Dutch province of South Holland. It is home to the historic Huis Honselaarsdijk, former palatial estate of the Dutch Princes of Orange. Huis Honselaarsdijk was one of the finest examples of Baroque architecture and grounds in the history of The Netherlands. Today, only part of the outbuildings remain, and these are referred to locally as "De Nederhof". Naaldwijk was previously a municipality in its own right, covering an area of 25.33 km² (of which 0.23 km² water). It included the towns Honselersdijk and Maasdijk. Maasdijk is a village in the Dutch province of South Holland. It is a part of the municipality of Westland, and lies about 5 km northwest of Maassluis. On 1 January 2004 the municipality of Naaldwijk was merged with the neighbouring municipalities De Lier, 's-Gravenzande, Monster, and Wateringen to create the municipality of Westland. Naaldwijk is now the administrative capital of Westland. De Lier is a village in the Dutch province of South Holland. It is a part of the municipality of Westland, and lies about 5 km north of Maassluis. It also lies about 6 feet (1.8 m) below sea level. 's-Gravenzande is a town in the province of South Holland, in the Netherlands. It is a part of the municipality of Westland, and lies about 12 kilometres (7.5 mi) southwest of The Hague. Until 2004 it was a separate municipality and covered an area of 20.77 km². Wateringen is a town in the Dutch province of South Holland. It is a part of the municipality of Westland, and lies about 5 km southwest of The Hague. Mari Silverster Andriessen was a Dutch sculptor, best known for his work memorializing victims of the Holocaust. Born and died in Haarlem, Andriessen is buried at the RK Begraafplaats Sint Adelberts in Bloemendaal, the Netherlands. Tynaarlo is a municipality in the northeastern Netherlands. Though located in the province of Drenthe, many of its communities serve as suburbs of the neighbouring city of Groningen, capital of the province of the same name. Monster is a town in the Dutch province of South Holland. It is a part of the municipality of Westland, and lies about 10 km south-west of The Hague. Westland is a municipality in the western Netherlands, in the province of South Holland. It covers an area of 90.58 km2 (34.97 sq mi) of which 11.05 km2 (4.27 sq mi) is covered by water and had a population of 106,752 in 2017. Ouderkerk aan de Amstel is a village in the Dutch province of North Holland. It is largely a part of the municipality of Ouder-Amstel, and lies about 9 km south of Amsterdam. A small part of the town lies in the municipality of Amstelveen. It is connected to Amsterdam by the river Amstel. There is another village called Ouderkerk in South-Holland, Ouderkerk aan den IJssel. De Cocksdorp is a town in the Dutch province of North Holland. It is a part of the municipality of Texel, and lies about 25 km north of Den Helder. Borger is a village in the Dutch province of Drenthe. It is a part of the municipality of Borger-Odoorn, and lies about 18 km east of Assen. Mariëndijk is a hamlet in the Dutch province of South Holland which lies on the border of Honselersdijk and the grounds of the former Paleis Honselersdijk Huis Honselaarsdijk. Heenweg is a town in the Dutch province of South Holland. It is a part of the municipality of Westland, and lies about 7 km northwest of Maassluis. Poeldijk is a village in the Dutch province of South Holland. It is a part of the municipality of Westland, and lies about 8 km southwest of The Hague. Nieuwe Tuinen is a town in the Dutch province of South Holland. It is a part of the municipality of Westland, and lies about 5 km north of Maassluis. Oostbuurt is a town in the Dutch province of South Holland. It is a part of the municipality of Westland, and lies about 6 km north of Maassluis. Clinge is a town in the Dutch province of Zeeland. It is a part of the municipality of Hulst, and lies about 28 km southwest of Bergen op Zoom. Clinge is located on the Dutch-Belgian border and joins with the Belgian town of De Klinge, in the Belgian municipality of Sint-Gillis-Waas. This border can normally be crossed freely. Kwintsheul is a village in the Dutch province of South Holland. It is a part of the municipality of Westland, and lies about 2 km southwest of the border of The Hague. Royal FloraHolland, legally Koninklijke Coöperatieve Bloemenveiling Royal FloraHolland U.A., is a Dutch conglomerate of florists. It is one of the largest auction companies in the world. Royal FloraHolland is headquartered in Aalsmeer, with locations in Naaldwijk, Rijnsburg and Eelde. Wikimedia Commons has media related to Naaldwijk . This South Holland location article is a stub. You can help Wikipedia by expanding it.